If you’ve been reading this blog for a while, it’s no secret that I love eggplant. Once roasted, this odd purple vegetable goes from stiff and a bit rubbery to smooth and luscious, and it pairs well with tomatoes, onion, lemon and olive oil to make a superbly easy and satisfying main course. So often vegetables are pushed to the sides of our plates, served up alongside a hunk of meat, but it’s time to of put vegetables where they belong: front and center as the main course. You can, of course, serve this stuffed eggplant as a side dish, but I assure you, once you’ve tasted these, you’re not going to be out looking for meat! Filled with a mixture of whole wheat couscous, fresh cherry tomatoes, spring onion and cilantro, and flavored with olive oil, lemon, smoked paprika and chili – these beauties are good served warm or at room temperature – which means you can make them ahead, use the leftovers for lunch, or even freeze the extras for a delicious meal later. The middle east has a version of stuffed eggplant which is a thing of legends: Imam biyaldi (the Imam fainted). The story goes that a young Turkish bride was given 12 large pots of the finest, most expensive olive oil for her husband. She made a stuffed eggplant dish stuffed with tomatoes, onions, garlic – and copious amounts of olive oil. Her husband loved the dish so much that he asked her to make it every single day. She did – for 12 days. On the 13th day, the stuffed eggplant was absent from the table. “Why?” asked the disappointed husband? “my dear, we are out of olive oil and I cannot make it until you purchase some more.” Upon hearing that the expensive gift had been completely used up, the Imam fainted. Imam biyaldi. My version uses olive oil too, and flavors of the middle east, though it is not like the traditional Turkish dish. I think you’ll love this, though! The recipe can be easily scaled up or down depending on the size of the crowd you are serving, and any leftovers will be fought over the following day. I typically serve 2 eggplant halves per person; though you could also serve one half plus a salad for a lighter meal. Cut the eggplants in half lengthwise through the stem. Lay the eggplants cut-side up on a parchment-lined baking tray. 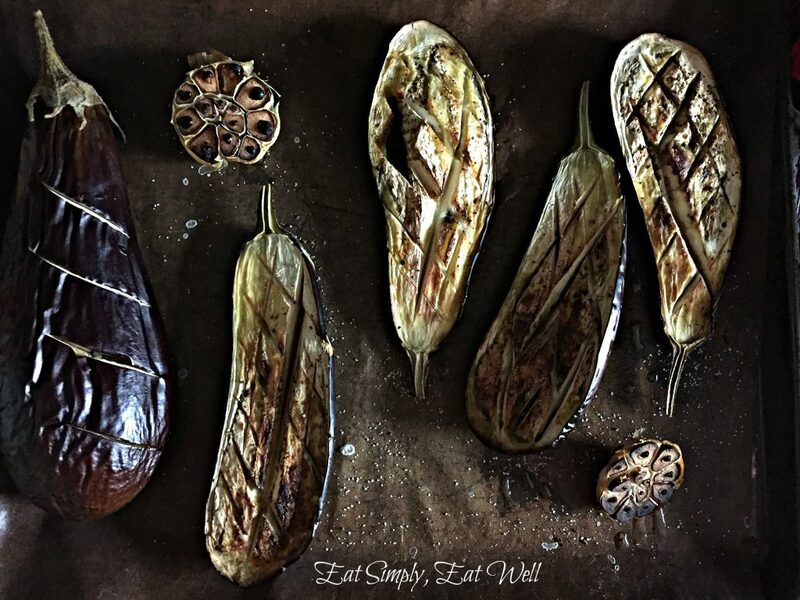 Using a small paring knife, cut a cross-hatch into the cut side of the eggplant. Sprinkle each eggplant generously with salt and pepper and drizzle with olive oil. Bake for 40-45 minutes until golden brown and very soft. Remove from oven. 1 small bunch of cilantro = 1 cup chopped stems & leaves; reserve the top leaves for garnish. *To make it gluten-free, use millet, cooked according to packet instructions. Pour the couscous into a small bowl and add 1/2 teaspoon salt and the boiling water. Cover with a plate and allow it to absorb the water for 5 minutes. Cut the cherry tomatoes into into fourths and place into a medium-sized bowl. Add the chopped cilantro, green onion, remaining 1/2 teaspoon salt, pepper, olive oil, paprika, chili powder, lemon zest and lemon juice. Mix well to combine. Check the couscous to make sure it has absorbed all of the water. Fluff it lightly with a fork, then add it to the tomato mixture. Stir well to combine. Taste; adjust seasoning if necessary. Top each eggplant half with 3/4 cup / 1.5 dl of the couscous mixture, pressing it down into the eggplant shell. I find it’s easiest to do this with my hands, but you can do this however you wish. 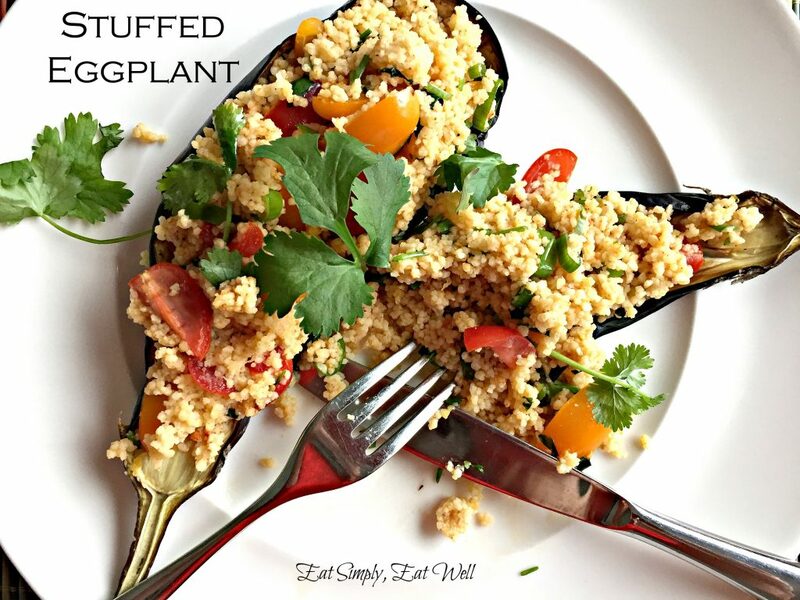 Transfer the stuffed eggplant to individual serving plates and garnish with the remaining cilantro. Did you like this post? 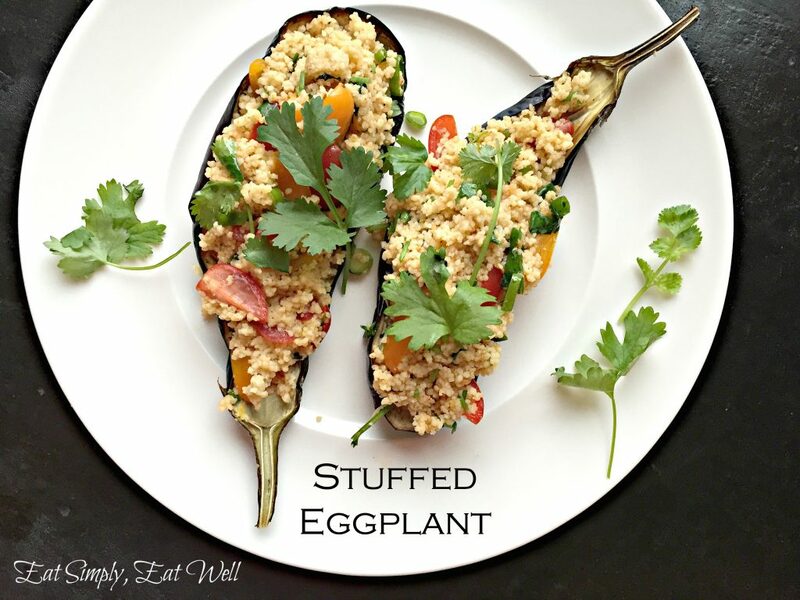 Do you have your own version of stuffed eggplant? Let me know in the comments below, and please share it with your friends! Have you signed up for the ESEW newsletter yet? Make sure you don’t miss the recipes and tips I send out in to subscribers. Scroll back up to the top and fill out the form on the right-hand side!